Something is not right in the relationship between Hayat Tahrir al-Sham (HTS) and al-Qaida. On 15 October, an announcement was posted on Sami al-Uraydi’s Telegram channel. “#Soon,” it said, “the series For God, then For History,” which was described as consisting of “testimonies on the split between Jabhat al-Nusra and Tanzim al-Qaida”. 50 minutes later the first such testimony was released and the war of words between al-Qaida and HTS had begun. In the coming six days, four further testimonies from Uraydi, and another from a close accomplice, followed and all with the same objective: to delegitimise leading HTS figures, namely Abu Abdullah al-Shami and Abu Muhammad al-Jawlani. The criticism in Uraydi’s new testimonies is thus not unprecedented. In fact, he has raised some of the same issues before. But for two reasons they are particularly noteworthy. The first is that the debate was set off by claims made in a personal conversation between al-Shami and an unknown person, apparently in response to al-Qaida leader Ayman al-Zawahiri’s latest speech, “We Shall Fight You Until There Is No More Persecution,” released on 4 October. 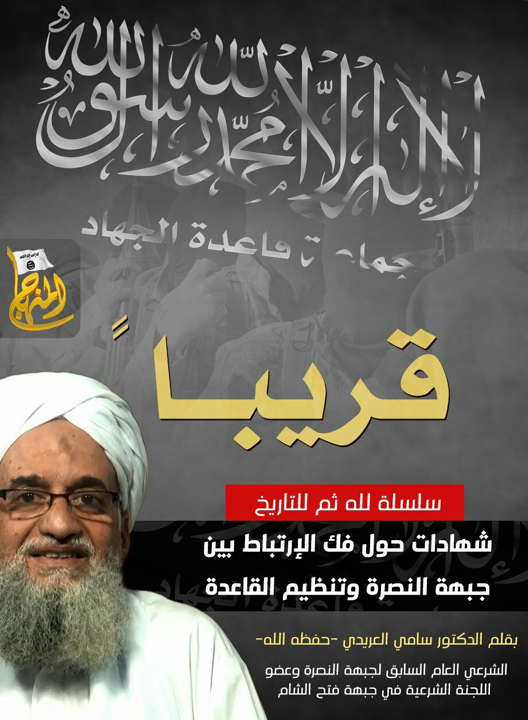 In the speech, Zawahiri criticised the breaking of ties and called for unity (implicitly under the al-Qaida banner). Al-Shami’s conversation was not intended to reach the ‘public’ but for some reason it did—or at least it was read by a large enough number of people that al-Shami deemed it to be out in the open. However, the leaked conversation has not been easy to track down and thus it continues to be a mystery exactly what al-Shami said about al-Zawahiri. The second reason is that this is the first time Uraydi is writing openly and frankly about internal Jabhat al-Nusra-JFS-HTS affairs, and he brings a great deal of authority to bear when it comes to this. He was a leading shari’ in Nusra and a member of both the sharia and shura council in JFS. This implies that he is a person with critical insider knowledge of how the break between Jabhat al-Nusra and al-Qaida actually occurred. Abu Abdullah al-Shami, a sharia council and possibly shura council member of HTS, is a heavyweight himself and thus the debate poses a risk to the cohesion of the al-Qaida-sympathetic community within and related to Syria. Cole Bunzel has already reported extensively on the debate between al-Shami and Uraydi, but Uraydi’s latest series deserves a bit more attention, not only because it is a scathing attack on former friends and allies but also because it offers insights into the process of breaking ties and identifies the actors involved. In Uraydi’s first testimony, released on 15 October, he begins by explaining that the reason why he has been silent until now is that he wanted to preserve the unity among the Jihadis. Yet the recent comments by Abdullah al-Shami regarding Zawahiri made it necessary for him to speak. According to Uraydi, al-Shami claimed that the break from al-Qaida was in fact legally authorised by al-Qaida itself, but for the former shari’ of Jabhat al-Nusra this was a plain lie. For some reason, Uraydi begins the first episode by talking about the merger of several groups in late January 2017 that established HTS. Two weeks after its formation, Uraydi, accompanied by Abu al-Qassam al-Urduni (Khalid Mustafa Khalifa al-Aruri), among others, went to see Zawahiri’s deputy, Abu al-Khayr al-Masri, to ask him about the new group. Abu al-Khayr told Uraydi and Abu al-Qassam that he did not know about this (Uraydi calls it “the complete breaking of ties”) except from the media and that he had not spoken to JFS/HTS officials for a month and a half. Uraydi goes on to ask rhetorically how the split from al-Qaida can be approved and legitimate if not even al-Zawahiri’s deputy knew about it beforehand. The testimony put al-Shami in a delicate position. Shortly after Uraydi posted the first instalment on Telegram, al-Shami rushed to his keyboard, not to write his own words but to quote others’. In a cryptic manner he responded, quoting the late al-Qaida ideologue Abu Yahya al-Libi saying that Jihad is not about organisations or people. Such organisations are a means rather than an end. Uraydi’s second testimony was released the day after, on 16 October. He relates that al-Zawahiri sent a letter to JFS leaders (meaning Jawlani) after the re-branding in July 2016 in which he ordered JFS to reverse its decision and re-establish ties with the al-Qaida organisation. Zawahiri informed Jawlani that a major decision such as breaking ones bay’ah (pledge) was not up to an amir (like Jawlani), Zawahiri’s deputy, or even Zawahiri himself. It was a matter for the al-Qaida shura council. After this letter, Zawahiri’s deputy Abu al-Khayr allegedly ceased giving his blessing to JFS after initially supporting the re-branding initiative (he had released an audio approving the re-branding before it took place). It took only another day before Uraydi published his third testimony in the series. To shed more light on what happened he explains the initial attitude of Jawlani and al-Shami at the time of the break. On several occasions, according to Uraydi, the JFS leaders said that if Zawahiri were to reject the split, they would “listen and obey”. Abu al-Faraj al-Masri (Ahmad Salama Mabruk), an old friend of Zawahiri’s, agreed with them. Were al-Zawahiri not to approve the split, there would be “no debate”. After the arrival of Zawahiri’s letter calling the split a “sin” and “act of disobedience”, a meeting was organised on 3 October 2016, probably in Jisr al-Shughour. We know that al-Qassam and Mabruk were there, and likely also Abu al-Khayr, Jawlani and al-Shami. Back in July, Mabruk was seated next to Jawlani (with al-Shami being the third person) in the video announcing JFS, and so he was a central person in the process. But he was also loyal to his old comrade and leader and it seems certain that he would not have accepted defying al-Zawahiri’s order. Perhaps luckily for Jawlani and al-Shami, Mabruk was killed less than an hour later when leaving the meeting. In his fourth testimony, released on 18 October, Uraydi goes on to provide more details about the actual content of Zawahiri’s private letter to the JFS leaders. According to Uraydi, Zawahiri reminded his correspondents of what he had said in public on the question of breaking ties, which was that the organizational link would never stand in the way of uniting the mujahidin in Syria, particularly in the event that they formed a “righteous Islamic government” in Syria (Uraydi emphasizes that Zawahiri said in Syria, not in Idlib). The breaking of ties could only happen after and not before the establishment of this righteous Islamic government, and even then it would be a matter for al-Qaida’s shura council to decide. Uraydi’s fifth and last one came a bit later. He deliberately postponed it due to the release of another testimony, one by his friend Abu al-Qassam al-Urduni, whom Uraydi himself referred to in several of his own testimonies. Although his name may not sound familiar to many, Abu al-Qassam is certainly a Jihadi with pedigree. Like Uraydi, he is also Jordanian and he was a friend and companion of Abu Musab al-Zarqawi’s since growing up in Zarqa. Both men (Abu al-Qassam and Zarqawi) travelled to Afghanistan in 1989 and stayed there until 1993. In the years 1993 to 1999, both were incarcerated in a Jordanian prison, but after their release the two travelled once again to Afghanistan, where Abu al-Qassam became the commander of Zarqawi’s training camp near Herat. In fact, at some point Abu al-Qassam even married a sister of Zarqawi’s. When exactly this took place is unknown. Abu al-Qassam was later imprisoned in Iran until he being released in March 2015, relocating to Syria to join al-Qaida, not the Islamic State. Abu al-Qassam begins his statement with a comment that probably resonates with many. Explaining that he does not like writing on the internet, he goes on to say that “the Sham arena makes people do what they hate”. Abu al-Qassam’s main objective is to lay out the position of Zawahiri’s three deputies Abu al-Khayr, Saif al-Adl and Abu Muhammad al-Masri, and since he spent several years with them imprisoned in Iran, no one is probably better situated to do just this. Abu al-Qassam confirms that both Saif al-Adl (former head of al-Qaida’s military council) and Abu Muhammad al-Masri (shura council member and senior operative) are living in Iran. However, contrary to al-Shami’s claim, they are no longer detained (since release in March 2015) but rather “they are forbidden from traveling … they move around and live their natural lives except for being allowed to travel”. Al-Shami had apparently said, in his private conversation, that Abu al-Qassam originally accepted the breaking of ties between Jabhat al-Nusra and al-Qaida when it was presented to him by Abu Muhammad al-Jawlani, but after discussing the matter with al-Adl and al-Masri changed his position and rejected the proposal. Abu al-Qassam confirms this and provides two reasons for his change of mind. The first was his view that Zawahiri should be consulted now that communication with the al-Qaeda leader was a realistic option. The second was that Zawahiri’s three deputies (Abu al-Khayr, Saif al-Adl and Abu Muhammad al-Masri) did not support the breaking of ties, and so neither would he. Extremely disappointed with al-Shami, Abu al-Qassam labels him a backstabber of his Jihadi brothers. Uraydi’s fifth instalment was finally released on 21 October. In it he offers his final attack on al-Shami. Quoting at length an interview that al-Shami had given in September 2015, he demonstrates that the pledge from Jabhat al-Nusra to al-Qaida was a shari’ contract, a legal pledge of allegiance that can only be dissolved when the group in Syria creates an actual Islamic state. Uraydi’s point here is that this stage was never reached, so to break ties with al-Qaida without the consent of al-Qaida’s leadership amounts to an act of disobedience (similar to Baghdadi’s disobedience to al-Qaida). Uraydi finishes his series by stressing the obligation of the Jihadis to ensure unity among their ranks. Al-Shami, if he gets the last word, would probably argue that Uraydi is causing more division than unity with his exhaustive attacks. Like the split and ensuing conflict between al-Qaida and the Islamic State, the current conflict between leading HTS figures and senior AQ-affiliated ideologues risks having wider repercussions, dividing Jihadis who were previously on the same side. For instance, Uraydi’s testimonies have already infuriated several people on Telegram who are loyal to both al-Qaida and HTS, leading to further mutual recriminations. Relations between HTS and al-Qaida-loyal figures are certainly deteriorating, and Jihadis with a history of supporting al-Qaida but who have recently supported HTS now find themselves in a tricky situation. Should one support Jawlani or Zawahiri? The conflict has not escalated to a point where it is impossible to support both, but this could happen. It seems there has been much more communication among senior Jihadi leaders in Syria than might be expected in this sensitive security context. Senior Jihadis seem to have been meeting on a regular basis as recently as early 2017. Saif al-Adl and Abu Muhammad al-Masri are active and one of them (probably Masri) is now Zawahiri’s first deputy. It was previously unknown to what extent they were engaged in the Jihadi project after their release, but Abu al-Qassam’s testimony leaves no doubt concerning their current level of engagement. That is certainly a positive for al-Qaida. A tweet by the author on October 5 is enlightening: “I start to slowly become more convinced that AQI cut its ties to AQ in October 06, but simply played it very strategically afterwards”. The difference is Baghdadi is not a liar! “A Review of Events”, the fourth as-Sahab interview, December 16, 2007.